As SAGA's Crescent and Cross pushes the game's scope geographically eastward, one of my current projects will take my game even more to the east - China, Tibet and the Mongolian Steppes. Following the collapse of the Tang Dynasty in 907, tribal peoples to the north of China enjoyed a brief respite from imperial interference. The first to dominate this political vacuum was the Khitans. The Khitans (pronounced kit-ens, not key-tans) were not originally steppe peoples, originating in forested highlands, but they eventually adopted the lifestyle and tactics of steppe warriors. Steppe tribes succeed under a strong visionary leader, and for the Khitans it was Yelu Aboji (r. 907-926). Under him, they conquered a very agriculturally rich strip of northern China called the Sixteen Prefectures, and at the same time extended their control over more nomadic steppe peoples to their north in Inner Mongolia. From the start, the Khitans set up a dual administrative system, with Chinese governance in the sixteen prefectures, and a traditional steppe tribal structure for the rest of their territory. Predictably, the Khitan rulers gravitated to the Chinese territories and increasingly abandoned the steppe lifestyle in favor of the luxuries of Chinese imperial governance. They were a formidable enemy to the Chinese for they combined the power of the steppe horse archers with the wealth and manpower of their Chinese cities. 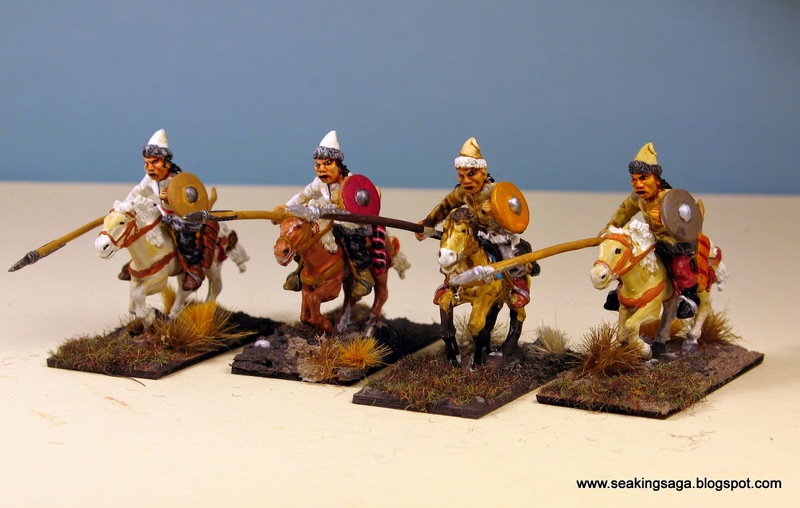 Below, Khitan light cavalry armed with lance or swords. 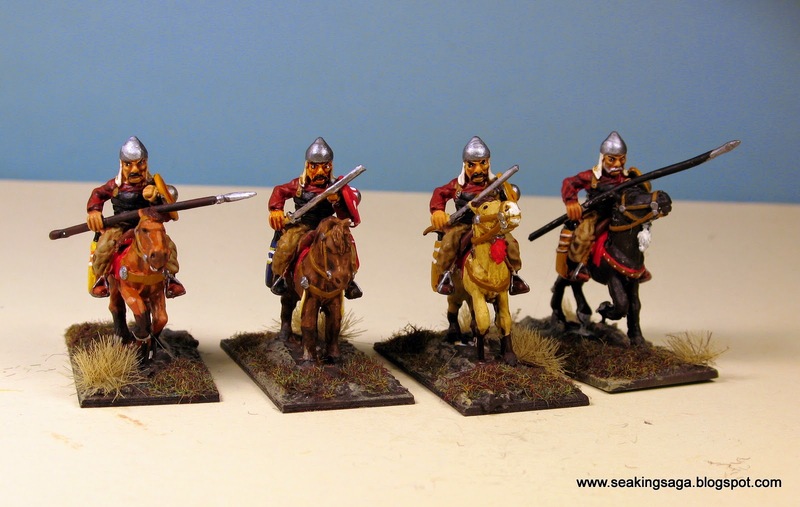 Figures from Essex, horses are from Essex and a variety of manufacturers. Another group of four with their bows in cases on the left side. The Jurchens were Khitan subjects from Mongolia. Below are four from an auxilliary unit. The Khitans were eventually destroyed by an alliance of the Song Chinese and the Jurchens. The Song never accepted the loss of traditionally Chinese territory to a barbarian people and hoped to manipulate another group of barbarians into destroying them. A common enough practice throughout Chinese history, but this time the strategy backfired on the Chinese. The Jurchen attacked Chinese territory and captured the Song capital and the imperial court in 1127. 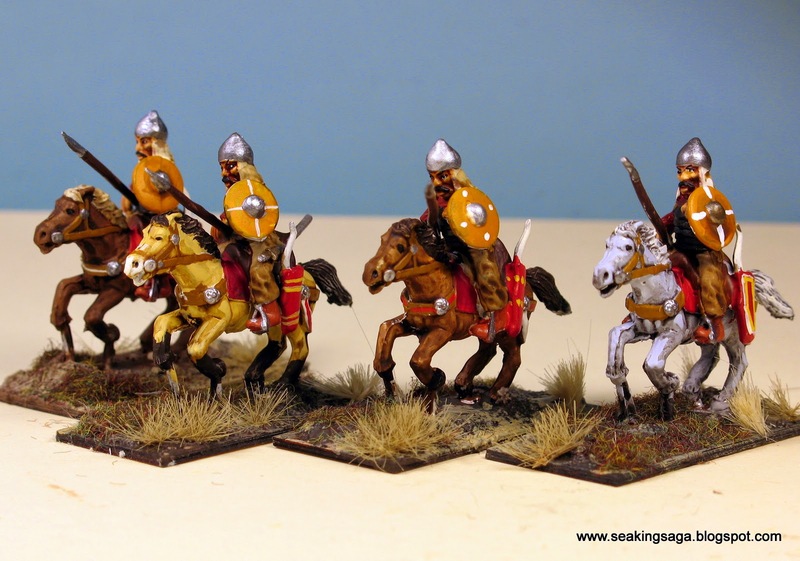 My next post on the Khitans will focus on their heavy cavalry and command, along with how I plan to use them in SAGA. 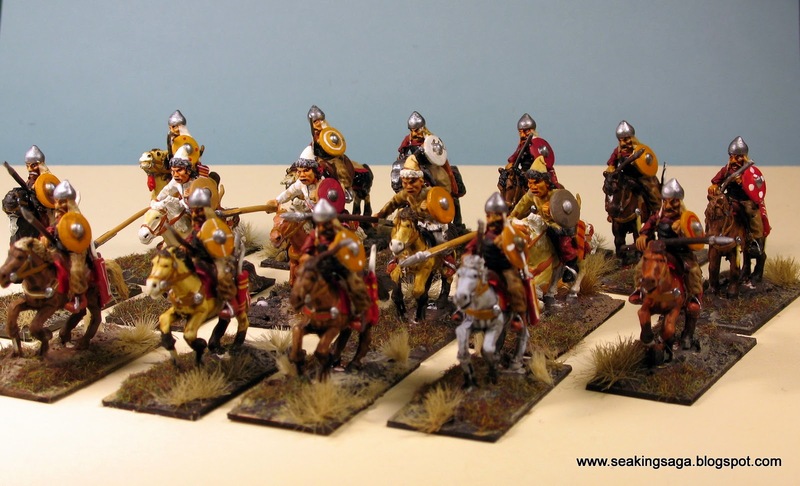 Very nice cavalry; bet they are pretty formidable in battle too. Packing Up - for now!